Our school attendance over the last year has been sitting at 94% which is well below the national average of over 96%. At Leamington Community Primary School we believe promoting excellent school attendance is the responsibility of the whole school community. Within school we promote good attendance through creative approaches to the curriculum. This includes topics of high interest, consistently good+ teaching, a wide range of exciting learning resources and stimulating learning environments. There is an expectation that over the course of a year (190 days) a child’s attendance will be at least 96%. Absence which fall below 90% is categorised by the government as persistent absence. 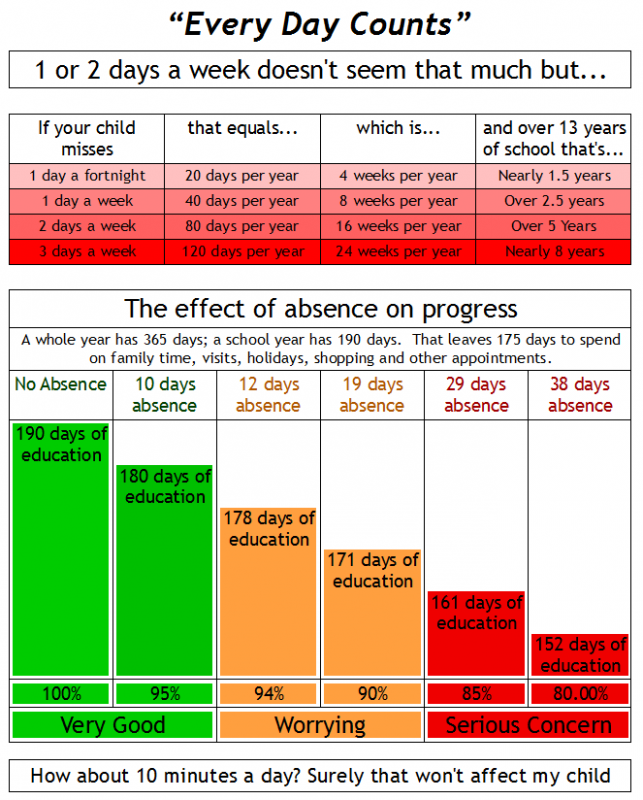 For a child to fall below the 96% target this autumn term they would have missed 5 days of lessons. All parents have the responsibility to ensure that their child attends school for the whole academic year by making medical routines out of school time (wherever possible), avoid booking holidays during term time and avoid encouraging their child to stay at home for reason which are judged to be unjustifiable by school. Request for ‘Leave of Absence’ during term time. Since September 2013 the Head teacher may only authorise leave for ‘exceptional’ circumstances. If a child goes on holiday during term time without the permission of the Head teacher this will be marked as an unauthorised absence and this may result in a penalty notice of £60 per parent per child being issued. A penalty notice can also be issued if a child misses a total of 5 days of school (not necessarily as 5 consecutive days) which are deemed to be unauthorised. Parents whose child is repeatedly absent will now only receive one warning notice period about a need for an improvement in attendance. If the attendance doesn’t improve or deteriorates again then no formal warning notice will be issued and we will automatically consider other statutory actions. Where strong evidence exists that the reporting of ‘sick leave’ is not genuine, Fixed Notice procedures will be imposed. Evidence could include: Social Media, Non-contact with school, school are unable to contact parents/carers, children reporting a holiday or other circumstances and children reporting non-illness. All medical staff across Liverpool have been asked not to make appointments (if possible) during school time. If your child is attending a medical appointment you must produce an appointment card/letter or similar paperwork prior to the appointment. On the day of the appointment your child must still attend school around the appointment. At Leamington we actively promote good attendance with a number of incentives. We have attendance raffles weekly and at the end of each term. We have attendance credits, where the class can earn money by ensuring their class attendance is above 96% for the week. This money can then be spent on class treats/activities. We have a number of attendance boards around school and we employ an Inclusion Officer to work with families whose attendance is at risk of falling below the target of 96%. We have updating our attendance policy. The policy will cover many of the points we have raised in this letter. We all have a responsibility to ensure every child attends school. If your child is absent without a justifiable explanation you are stopping them from learning and this is unacceptable. The school has a legal duty to publish its attendance figures to parents and promote attendance. Equally, parents have a legal duty to make sure that their child attends school. School staff are committed to working with parents to ensure every child achieves their potential by attending school every day.